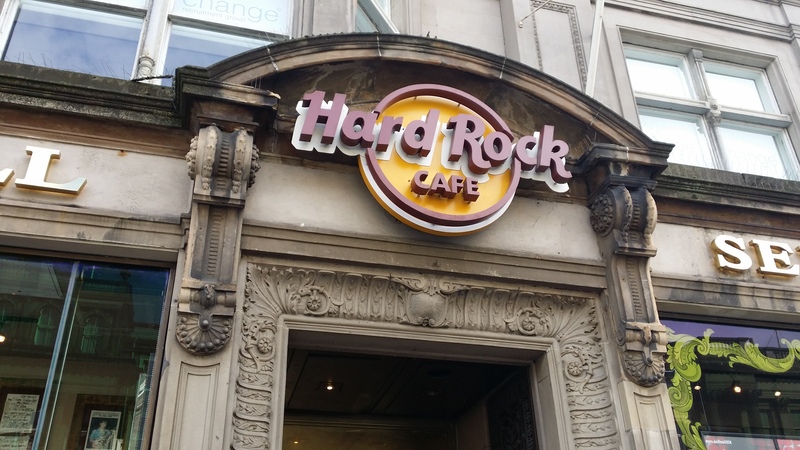 I was interested to see that the Hard Rock Cafe was named as one of Edinburgh’s favourite restaurants in a recent STV poll of local diners. There were actually quite a number of places on the list that I hadn’t visited so I was glad to begin addressing that, today. I was joined by regular guests Ayla and Patrick. Ayla was having a nap during our visit, so didn’t sample any of the food. We had a new guest quester in the shape of Mr Burt Darwin, an intriguing fellow from whom you’ll hear more in the form of a questude, later in the review. As a global chain, Hard Rock is one of those places where they ask you if you’ve visited before, to establish whether they have to run you through the blurb about what it’s all about, how their menu works etc. As a first timer in any of their branches I was treated to this, which conveyed that their menu is broadly the same the world over with the exception of a local burger option. In the case of the Edinburgh branch this is a haggis burger. The approach to service is attentive and extremely loquacious. It’s unashamedly American in its influence. There were aspects of it I genuinely loathed and I feel sorry for anyone who has to be that relentlessly perky as part of their job, but it was undeniably friendly and thorough. The place has some very nice inlaid wood detailing and the expected array of rock memorabilia as the cornerstone of its decor. Tables are packed in rather tightly to meet the considerable demand making it feel rather cramped. The walk to the toilets involved a number of pauses to avoid collisions, for example. 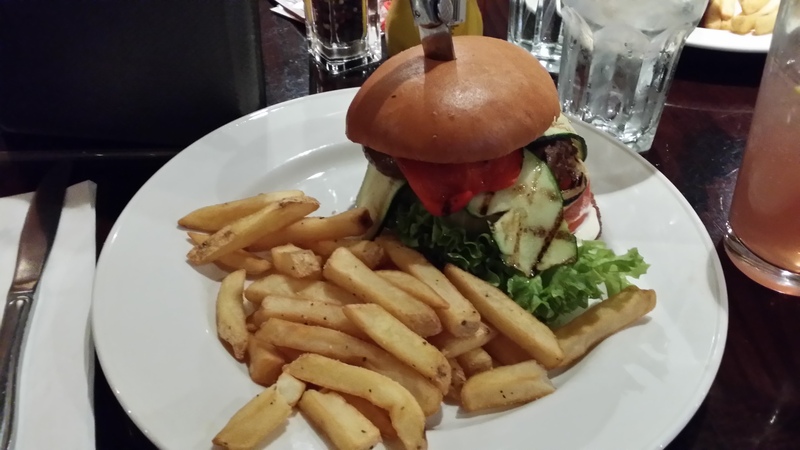 Our pervading requirement was for burgers; barbecue, California and veggie were our chosen varieties. Burt tried a Southern Rock cocktail which was rather sickly sweet and served in considerable quantity. 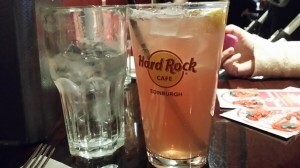 The £11.20 pricetag included buying the branded Hard Rock pint glass. The burgers arrived looking interesting with a knife stuck in each of them as a skewer. As part of the extensive speechifying, there had been a mention that the beef burgers would be cooked medium. Both were entirely cooked through. The veggie burger was a soya burger designed to look as much like meat as possible. The accompanying mushroom, peppers and courgette didn’t pack much flavour, but the burger itself had good moisture to it. The bun wasn’t great, but the caramlized onions were good. The fries were probably the standout item. The jury was divided on the beef burgers with some approval and some less positive noises. They were too lean and crumbly for me and both toppings a little characterless. The ranch dressing was given a big thumbs up, though. 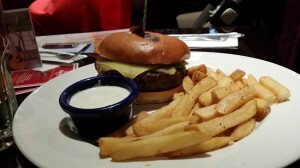 So overall, it was a mixed bag from the Hard Rock Cafe. Their dishes are very over-priced making their value proposition quite unappealing, but there were aspects of the food I quite liked. The service and ethos is trying to sell you a lifestyle not just food, which isn’t up my street at all, but you can’t fault their relentless optimism. Their offering is seeking a uniform consistency across all of their locations, so it felt like “international waters” rather than anything to do with Edinburgh. I’m sure Burt, who’s a big fan a cruise ships, felt right at home. It’s not somewhere I can see myself visiting again, but if you find yourself there or subscribe to the Hard Rock way of the world you’ll likely find the food to be of reasonably good quality. I grew up eating key-lime pie and drinking sweet tea and like sugar just fine. But my Southern Rock cocktail with Jack Daniel’s Whiskey, Southern Comfort and Smirnoff Vodka was drowned in something so sappy sweet even my vegitastic Veggie Leggie burger couldn’t soak up the sacchariferous drink. I’m pretty sure I earned points for the afterlife by holding my tongue.